Long-term complications include vomiting and gallstones. You might take antibiotics before coming to the hospital. You might take laxatives and/or an enema to clear your intestines. Several small cuts will be made in the abdomen. Gas will be pumped in to inflate your abdomen. This will make it easier for the doctor to see. A laparoscope and surgical tools will be inserted through the incisions. A laparoscope is a thin, lighted tool with a tiny camera. It sends images of your abdominal cavity to a monitor in the operating room. Your doctor will operate while viewing the area on this monitor. Surgical staples will be used to create a small pouch at the top of your stomach. This pouch, which can hold about 1 cup of food, will be your new, smaller stomach. A normal stomach can hold 4-6 cups of food. Be aware that in some cases, the doctor may need to switch to an open surgery . During an open surgery, a larger cut in the abdomen will be made to do the surgery. You will begin with 4-6 meals per day. A meal is 2 ounces of food. Bariatric surgery. EBSCO DynaMed Plus website. Available at: http://www.dynamed.com/topics/dmp~AN~T483434/Bariatric-surgery . Updated October 23, 2017. Accessed December 21, 2017. Bariatric surgery. National Institute of Diabetes and Digestive and Kidney Diseases website. Available at: https://www.niddk.nih.gov/health-information/weight-management/bariatric-surgery. Accessed December 21, 2017. 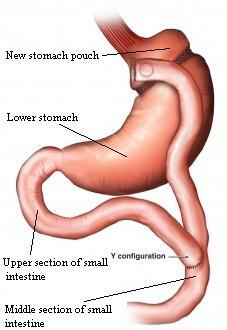 Obesity surgery: Roux-en-Y gastric bypass. Cleveland Clinic website. Available at: https://my.clevelandclinic.org/health/treatments/17285-obesity-surgery/roux-en-y-gastric-bypass. Accessed December 21, 2017. Roux-en-Y gastric bypass. Columbia University Medical Center website. Available at: http://columbiasurgery.org/conditions-and-treatments/gastric-bypass-surgery. Accessed December 21, 2017. Roux-en-Y gastric bypass weight-loss surgery. Johns Hopkins Medicine website. Available at: https://www.hopkinsmedicine.org/healthlibrary/test%5Fprocedures/gastroenterology/roux-en-y%5Fgastric%5Fbypass%5Fweight-loss%5Fsurgery%5F135,65. Accessed December 21, 2017.